Is this history in the making? 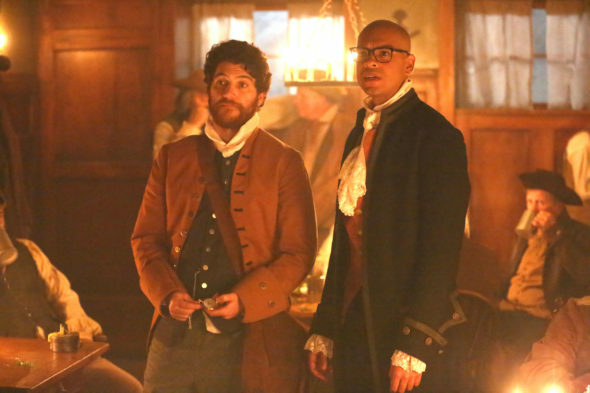 FOX has cut the episode order of its Making History TV show, from 13 to nine. Happy Endings‘ Adam Pally, Gossip Girl‘s Leighton Meester, and Girls‘ Yassir Lester star in the new time-travel comedy from Phil Lord and Chris Miller. The network plans to debut the show in the midseason. Will Making History be Cancelled or Renewed? Making History finds itself in circumstances similar to the first seasons of Superstore and Telenovela (then known as Hot and Bothered). This time last year, NBC reduced its orders for both sitcoms from 13 to 11, before their midseason premieres. The network went on to renew Superstore for a second season. It did, however, cancel Telenovela, after one brief season. Contrast Making History‘s situation with that of ABC‘s new series, Notorious. The legal-media drama premiered in September. ABC decided earlier this week to cut the production order from 13 to 10, because of ratings. ABC’s decision was made based on performance. It is a clear indication it is likely to cancel Notorious, unless the ratings improve. In conclusion, while a shortened first season is not the best news for Making History, the show still has a fighting chance. It almost always comes down to ratings. What do you think? Do you plan to check out the first season of the Making History TV series? What is your prediction? Will Making History be cancelled or renewed? Let us know what you think, below. More about: FOX TV shows: canceled or renewed?, Making History, Making History: canceled or renewed? Making History: Is the FOX TV Show Cancelled or Renewed for Season Two? The show is becoming more unwatchable with each episode. It suffers from the “Bill and Ted’s Excellent Adventure” problem. You can only suspend disbelief so far before it’s just not funny anymore. The first episode was pretty hilarious, but it went down here extremely fast. I couldn’t make it all the way through episode 4, and I turned off episode 5 after the first 10 minutes. I won’t be back. Making History is toast. Totally stupid show.